The Trustees of the Moorestown Improvement Association (MIA) are proud to announce the 112th Annual Meeting of Moorestown’s oldest civic organization. This esteemed entity was founded in 1904. From that first year they carried out programs and projects designed to benefit the population of the entire town. MIA had the first water well dug and the first concrete sidewalks and curbs installed, as examples of their early efforts. As stipulated in our charter, we are to hold an annual meeting where all members as well as the general public are invited to attend. 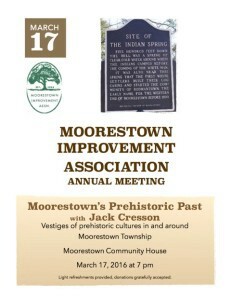 The program for our 2016 Annual Meeting will feature Jack Cresson, Moorestown’s resident archaeologist. Cresson will speak about Moorestown’s prehistoric past, an overview of the prehistoric sites that are located around town. The trustees are inviting everyone to come and learn about who was living in our town’s area well before it was an established municipality. The meeting is free and light refreshments will be available. The location of the Annual Meeting is the Garden Room of the Moorestown Community House and it begins at 7 p.m. on March 17. Memberships and donations to help us continue our work can be sent to the Moorestown Improvement Association, P.O. Box 404, Moorestown, N.J. 08057. Please ‘like’ us on Facebook or go to our website at: moorestownimprovement.org/membership/ for updates on our bi-annual walking tours of the town and our other projects.